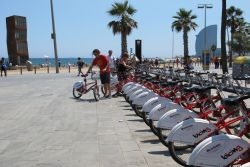 Welcome to the newest form of urban Barcelona transport… Bicing! 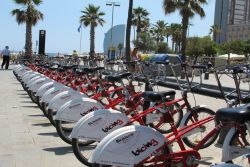 Bicing is the name of a bicycle sharing system in Barcelona inaugurated in 2007. 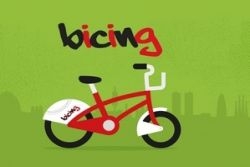 The name is derived from “bici”, the Catalan and Spanish word for bike, with the English suffix “ing” on the end. 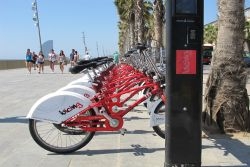 If you are a tourist or are only in town for a short while, this service is probably not right for you, but our city offers other ways to rent a bike in Barcelona. Bicing is designed for those people lucky enough to call Barcelona home. If you are a permanent Barcelona resident, student or simply staying here for a few months, Bicing is definitely worth considering! Many of the Bicing stations are located next to public car parks, Metro and FGC train stations which allow you to combine your journey and go wherever you want, whenever you want! You can use an automated system to withdraw a bicycle from one of more than 400 Bicing Stations around the city. When you have finished your journey, simply return the bike to the closest Bicing Station. It’s as simple as that! This is the perfect way to make a short trip around the city, especially in the summer months when the Metro is stuffy and hot! The service operates 365 days a year and you can take a bicycle at any time between 05:00 and 02:00 Monday through Thursday. After this time you may only return bicycles. On Fridays, it operates from 05:00 and 03:00 and Saturdays and Public Holidays the Bicing service is in operation 24 hours. The only way it works for the moment is with a one year subscription and the price is 46.46 € which means that riding a bike in Barcelona is eco-friendly, healthy and cheap! What else do you need to discover the best attractions in Barcelona or get from one point to another in the city, avoiding traffic congestion in a climate-friendly way? Check the map here below where you can find the next bicing station and what streets in Barcelona have bike lanes.